First of all, if you’re off dairy, this one is not for you. It’s also not for every day. This is a cheesy splurge. However, it IS gluten free and grain free, which should count for something, I think. 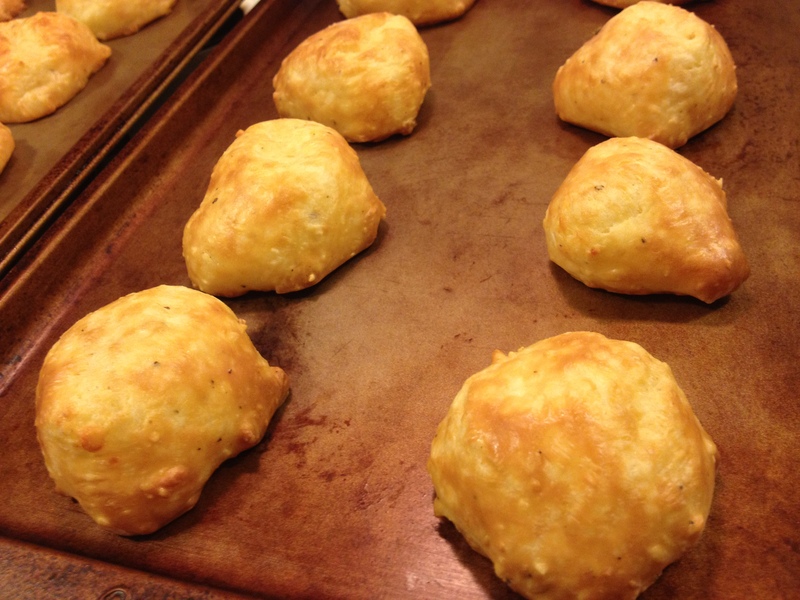 It’s a play on a Brazilian style of cheese roll, called pão de queijo. And it is fully customizable! Let’s talk about what we’ll be using in place of flour. Cassava root has New World origins, with the oldest direct evidence of cultivation coming from a 1,400 year old Mayan site in El Salvador, and most likely having been domesticated as many as 10,000 years ago. Cassava is also known as manioc, yuca, and is the source for the beloved tapioca. Now you know where your bubble tea and your tapioca pudding comes from! We’ll be using a processed form of cassava known as tapioca starch/flour. It’s a super light, fine powder, and can be used in place of things like corn starch. But as you are no doubt aware from tapioca, this stuff can get gummy, so use wisely, Amazons! Speaking of gummy, this bread is not going to have the consistency of traditional bread. It’s going to be kind of gooey and gummy in the center. You may like that, you may not. Nevertheless, always fun to try something new, right Amazons? Pão de queijo is made somewhat in the style of a gougère in the sense that the dough is semi-cooked in a pan before it’s baked in the oven. Start by putting the milk and butter in the saucepan and bringing to a boil. You’ll want to have all your other ingredients ready to go, because once this starts happening, it’ll go pretty fast and you don’t want to have to stop to find something. Once the milk has come to a boil, remove from the heat and add the tapioca starch, stirring continually. You’ll have a stiff ball of goo almost immediately. This is why you want a really strong, rigid spoon for stirring. Then add the mozzarella and stir in. (Sideline: You can use any number of cheeses for this. I’ve used queso fresco and cheddar to great success. Parmesan is also recommended.) Consider this your arm workout for the day. 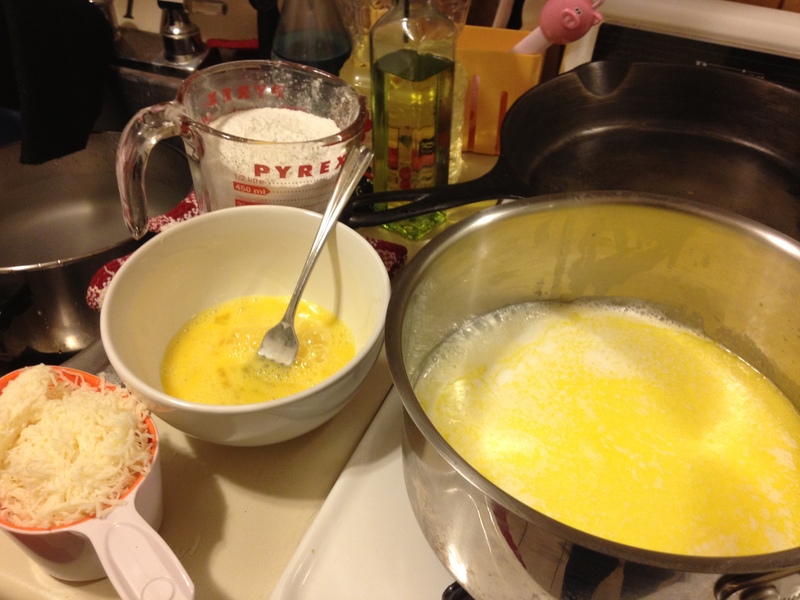 When the cheese is incorporated, the dough and pan should’ve cooled enough to add the eggs and stir them in. Add the eggs when the pan is too hot, and you’ll just end up with scrambled eggs and tapioca goo. Season with salt, pepper, and whatever else you want. Rosemary or garlic might be nice. Maybe some chili powder or your favorite hot sauce. Keep stirring until it’s a smooth, incorporated, goopy mess. I recommend greasing your baking sheet or muffin tin to ease removal. 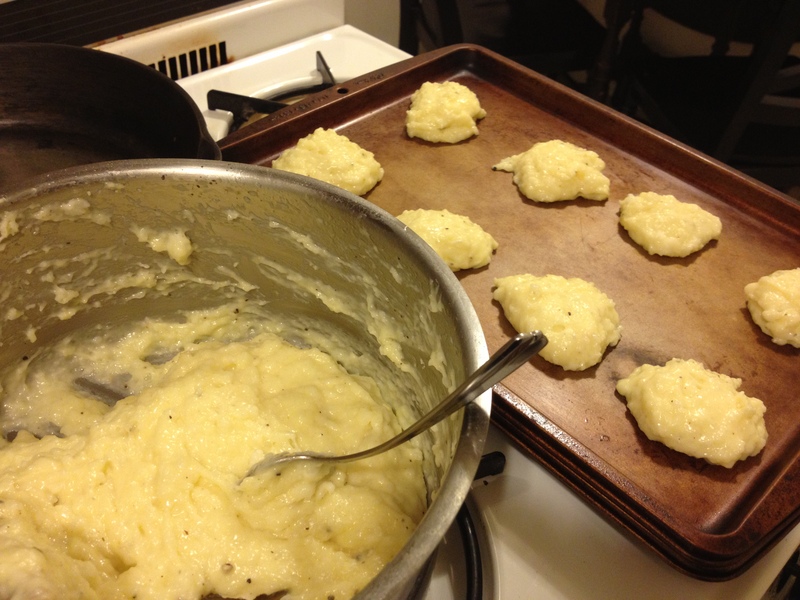 Then use the two small spoons to drop equal portions of the dough onto the sheet or into the cups. These will puff up a bit, so try to leave some room. Pop into the oven for about 30 minutes and remove when golden brown. Definitely let these puppies cool. They’ll be molten and messy and hard to move until they’ve come down in temperature. Serve as a nice, gluten free dinner roll or as a snack with your morning coffee.